sided/Double density and high speed transfer. Single density drives can read Enhanced density disks). 4. Full sector count displayed, no more 999+. 5. Full support for Newell 256K memory upgrade for 800XL. 7. Bug in RAMdisk reboot (coldstart) routine fixed. 8. The right margin is no longer set to 37. Using SUPERDOS with an XF551. up and then it is extended. Using SUPERDOS with a RAMdisk. RAMdisk contents to a physical disk before turning off your computer. and other Axlon compatible 288K byte memory expansions in 800s and 400s. 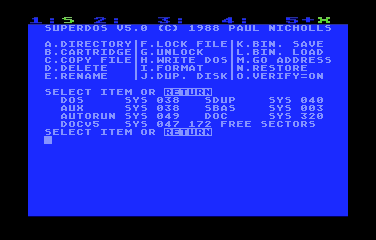 area and the contents of the RAMdisk are preserved. which erases it. Here’s how to prevent that: from SUPERDOS load AUX.SYS. Press X to turn RAMdisk Enable off (0). Press P to re-initialize DOS. blank disk. Label this new disk REBOOT SUPERDOS. as you access the RAMdisk, it will be restored. Using SUPERDOS with an 800/400. compatible memory expansion, SUPERDOS will store SDUP there. “resident” at the bottom of memory. there. Be sure to save your materials before calling SDUP. Boot your system with the appropriate disk for the job you want to do.